I wouldn’t call The Bridge of Peace in Tbilisi, Georgia an eyesore but during the bright daylight hours is certainly sticks out against the backdrop of the “old” part of town. Sitting above the Kura River that winds its way through the middle of Tbilisi, The Bridge of Peace (built in 2010) practically screams, “I am modern!” next to places that are well over 800 years old. Georgians, who are probably the friendliest people I’ve ever encountered, will tell you enthusiastically to visit the bridge, and you should, though I’d amend that to add: at either sunrise, sunset, or after dark. So after visiting The Bridge Of Peace at sunrise, sunset, and in the middle of the night (after partaking in the Georgian pastime of drinking far too much wine), I could go back to my enthusiastic Georgian friends and tell them what an impressive sight I saw. The Bridge Of Peace was designed by Italian Michele De Lucchi, built in Italy, then broken down into 200 pieces and driven to Tbilisi. 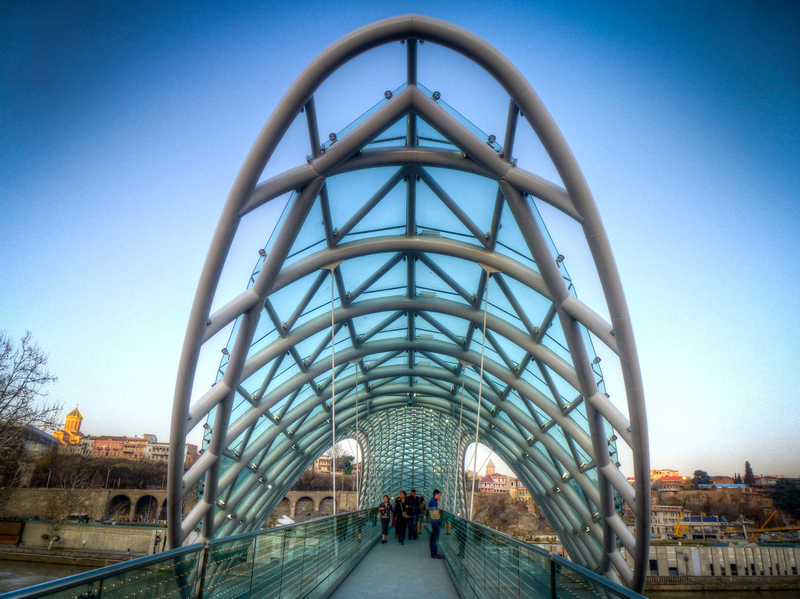 Considering how far Georgia has come since 2003 and 2008, it seems only appropriate a bridge of peace would be put together in this capital city. Hope you’re enjoying your continued travels as well! It’s a good time to visit Georgia as not many others are. That is very interesting and reminds me quite of the south of Spain, where you find churches on practically every corner. Many of which the locals say was a reaction to being under Moorish rule for so many centuries. Though I am now very curious about the new cathedral in Bucharest, to contend with the Palace of the Parliament it’s probably going to be massive! I’m glad you enjoyed the photo, thanks! I’ve looked and I’ve studied – and I’m a big fan of the Bridge of Peace. There’s a lot of this in the northwest of England (on a smaller scale) where we’re from. Modern bridges that really challenge you to stop and stare, erected in the midst of a Victorian backdrop. Clever architecture – when it’s done right. Let’s hope the Bridge of Peace’s message works. I guess that’s the sign of a good architect, to create something different and still have it blend with its surroundings. I’m now curious about the bridges in northwest England to see how they’ve been built into the surrounding architecture.